Summer time without watermelon is like a birthday without cake and ice cream. I know I’m not alone in feeling this way because there have been countless watermelon themed ideas popping up all over Pinterest, Facebook, and the mom-blog world for several weeks now. Our own family is on our….11th? 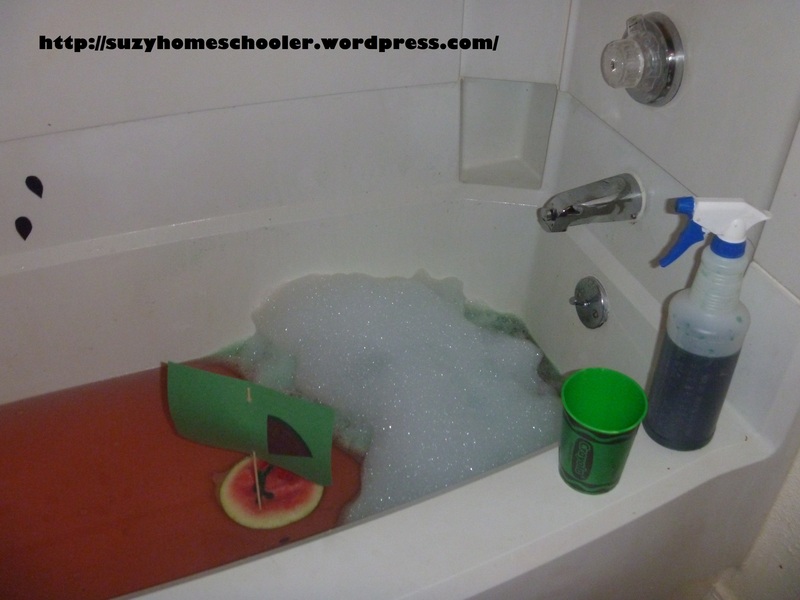 or maybe its 12th…watermelon of the season and we decided to extend the fun that is watermelon into a theme bath. Bear with me because the pictures aren’t the greatest quality. I could blame the camera but really I’m just a horrid photographer, lol. We started out by pouring a packet of watermelon Kool-Aid into our bath water to dye it red and give it a bit of scent. Then we cut seed shapes from black foam, floating some of them in the red water and sticking the rest to the tub wall. Foam naturally sticks to tile when wet, in case you didn’t already know. We also used some bubble soution, but tried to keep the bubbles to one side of the tub. We sprayed the pile of bubbles with some diluted green food coloring so they’d look like a rind. 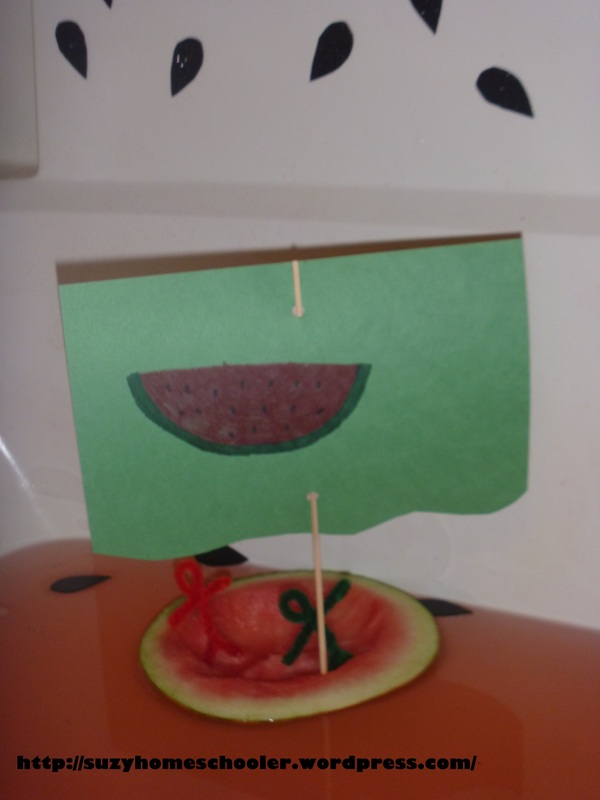 The final touch was boats made from actual watermelon rinds, an idea I got from Growing A Jeweled Rose. For ours I used a bamboo skewer to hold up the sail. The sail is simply half a sheet of construction paper. The back is secured with a bit of duct tape. 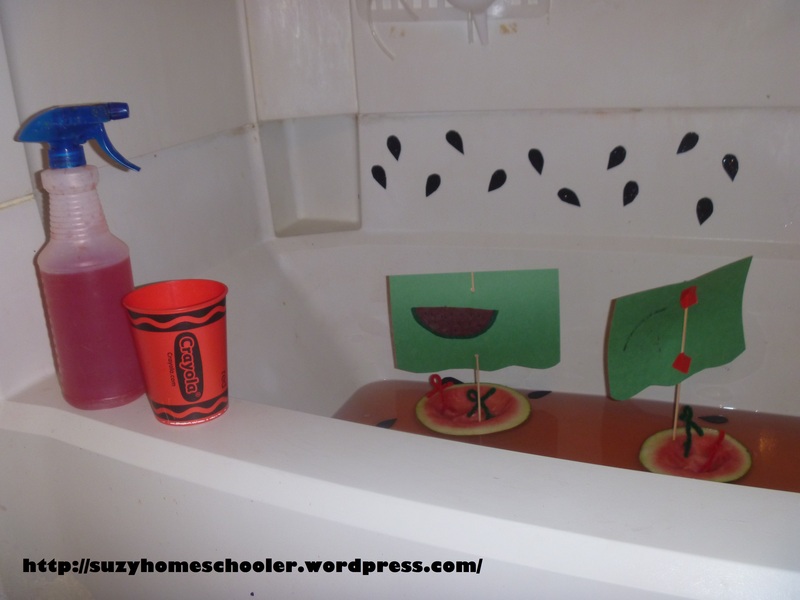 I left out the usual bath toys in watermelon color themes: red and green cups, spray bottles with red and green water. 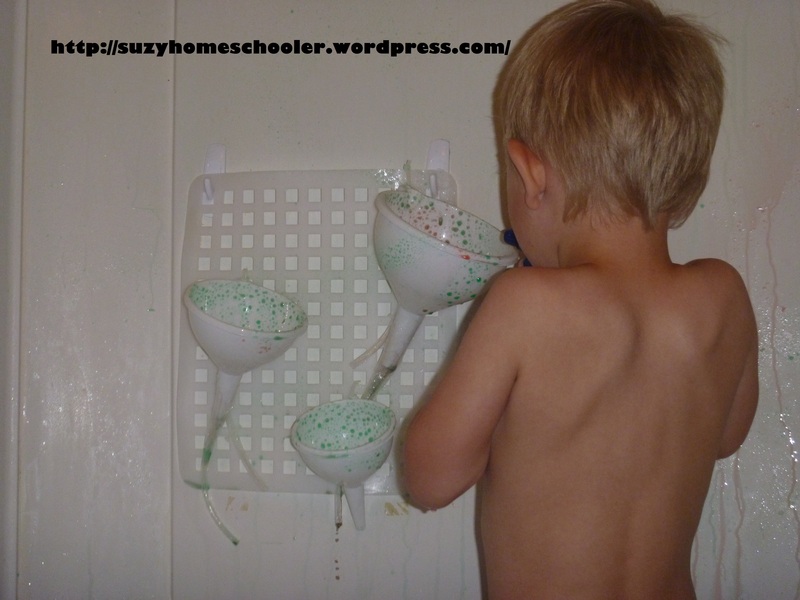 LittleMan just loves using the spray bottles to spray colored water into our water wall and watch it drip down. And of course, what good are boats without passengers? I made 2 passengers for each boat, one red and one green. Each passenger was made from a single pipe cleaner so they were quick and efficient to make. Another cost effective, fun summer memory made. Travel-Sized Pet Rock and Pet Rock Home - Kids Art Exchange!